My heartiest congratulations to all the students who have made us proud and make this beginning of journey a very beautiful event in the way to become CA by scoring high mark in the exams within a very short period of time. The young aspirant with shining eyes which reflects dreams of imbibing whole sky in their hands is am azing. The eagerness of hearing their names on stage, exceptional smiles on face and clapping all around is the highlights of the prize distribution function. This is probably something which reminds you about your own days when you were young holding plenty of dreams in eyes. Their energy made the day and tiredness was not at all anywhere. All the students were so happy that they couldn’t stop themselves from sharing their experience while they were learning here. 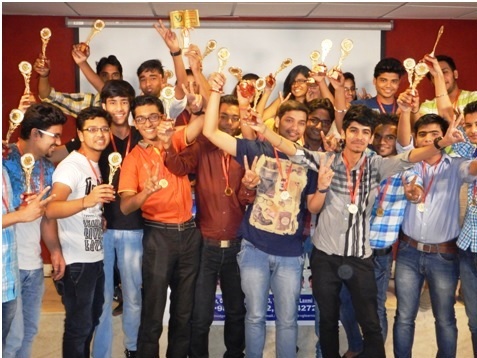 They have shown tremendous gratitude towards their teachers who were present there to give them trophies. They were all proud happy with the same joy as the students have. They guided the students for the future and wished them all the best. Our Director Ms. Sana Baqai was also present at the function. She was overwhelmed with the success of students and the result of hard work. She talked to the students as well as faculty and motivated them to keep their results always good and better than the last result.